But Rihm’s are of an entirely different cut altogether: after all, what we hear is not a “final rage”, but a violent outburst standing at the beginning of a long musical development. “I believe that it is important today to compose music that is totally lost to the world and only knows itself,” said Rihm about Dis-Kontur in 1975. “Only such music will be able to heal the art of composing where it was bruised by buzzwords.” It was already in his next composition, Sub-Kontur (1974/75), that Rihm took yet another step in the same direction. But while he did not level the hammer strokes of Dis-Kontur, Rihm did not allow his listener to meet them head-on either. Instead, he chose subtler means to express them. “Both pieces are big chunks chewing up symphonic topoi. In a way, Dis-Kontur is a symphonic march. 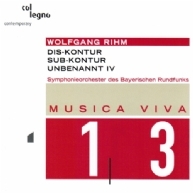 Sub-Kontur is a kind of adagio that pushes upward from below, or so I thought back then.” In his Unbenannt IV (2002/03), a concerto for organ and orchestra of sorts, Rihm wanders about in search of the sonically and spatially varied relationships between the solo instrument and the orchestra groups. What he is looking for here is the “organic whole” (Rihm) constituted by orchestra and organ. A particularly gripping release in the series Musica Viva! Number 4 of the Salzburg Festival “Kontinent” series was dedicated to Wolfgang Rihm. We have compiled a selection of the works for your convenience – including a first recording! “Subtle nuances, crystal-clear intonation, expressive force”: Wolfgang Rihm’s early String Quartets Nos. 1, 2, 3 & 4, extraordinarily played by the Minguet Quartet. The diversity of the seemingly incompatible: Points, contrasts and shapes of sound in Rihm’s string quartets Nos. 10 and 12 and the Quartettstudie.